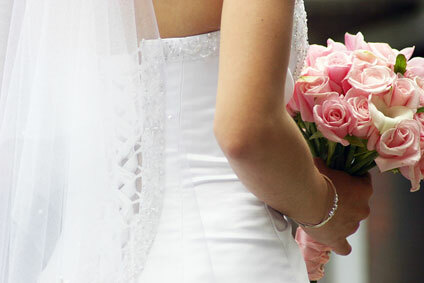 Your bridal bouquet is the finishing touch to your wedding dress. 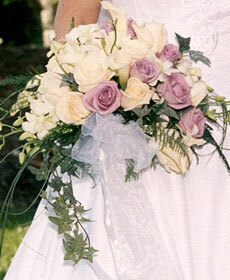 The bouquet should reflect your personality and complement, rather than compete with, your wedding gown style. While white flowers are traditionally chosen for the bride's bouquet to symbolize purity, many brides today choose to mix in colors which match the bridesmaids' dresses or site decor. 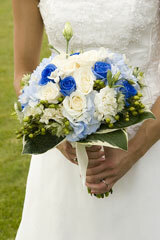 Clear communication with your florist is essential for successful choices of bridal bouquet flowers and colors. Show your florist staff a picture of you in your wedding gown. Give them a sample of the fabric, if possible, because not all wedding gowns are pure white. Show them pictures of flowers you like and let them know your favorite colors. Tell them which flowers you don't especially like. Also, specify whether you want flowers for your hair or veil. If your wedding dress has a simple design with few embellishments and clean lines, choose a bouquet that is also simple and has the same clean lines and minimal design. In many instances, a monochromatic color with an accent flower is a good choice. Calla lilies, tulips, orchids, or a hand-tied bouquet of roses often work well. A romantic, princess-style gown with ruffles, pearls, and lace looks better with a traditional cascading bouquet or a large, round bouquet filled with blossoms. Just make sure the bouquet is not too large, especially for a petite bride. 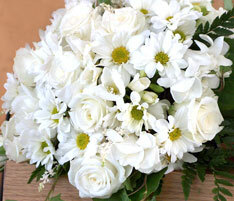 Remember, the bouquet comes down the aisle ahead of the bride, so you don't want the flowers to overpower her. Roses, sweet peas, peonies, hydrangeas, daisies, iris, carnations, freesia, and greenery such as ivy, seeded eucalyptus, and ferns give the bouquet a romantic, fresh-from-the-garden look. If you like a natural style, you might choose wildflowers or flowers from a friend's garden. You could use coneflowers, sunflowers, black-eyed susans, grasses and herbs, bluebonnets, zinnias, daisies, Queen Anne's lace, tulips, or peonies. For Fall and Winter, evergreens and berries can add a nice accent. When planning a formal, candlelit wedding, you could choose a hand-tied bouquet of roses embellished with pearls and ribbons. On the other hand, a graceful spill of orchids could enhance a cascade of roses, lilies, and greenery; this type of bouquet might fit well with your formal gown style and cathedral length veil. Brides have the choice of an arm bouquet, such as a long-stemmed arrangement, or a handheld bouquet in any size, color, or style. While fresh flowers are a fragrant choice, silk flowers can be arranged ahead of time if the bride wants to do her own bouquet; a silk flower bouquet can be kept for years after the wedding as a keepsake. Take time to look through wedding magazines and the books at your florist. Choose flowers that are appropriate for your dress style, season, and location. Because of fast, worldwide shipping, the floral options available year round today are abundant. The Knot Book of Wedding Flowers, by Carley Roney, is a helpful guide to wedding flower selection and bouquet design. Shane Connolly's Wedding Flowers features extensive discussions and photos of classic, romantic, and alternative wedding flower styles. This florist information website features selected online flower suppliers where you can find an extensive selection of wedding flowers and bouquets.